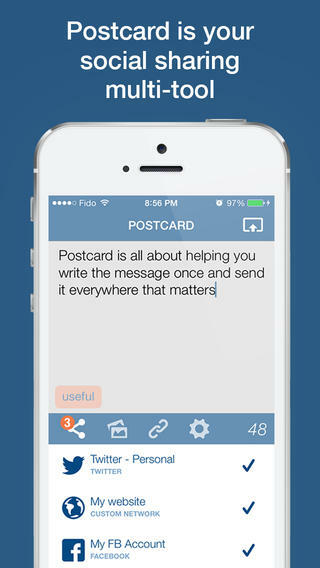 If you manage a lot of social networks in addition to writing for your own blog, you should check out Postcard. Creating a “Post” on the app will allow you to create new content on your WordPress blog, Twitter, Tumblr, and Facebook – all at once. The app comes from a WordPress blogger, Kyle Newsome, who developed a free WordPress plugin to work with the app. Postcard is targeted primarily at helping anyone who takes their social content creation seriously, from individuals to businesses. It is a Swiss Army knife-like tool for social networking that empowers social media managers, businesses and independents by giving them greater control over where and how they post. The free app supports up to three social networks, but additional ones can be added with in-app purchases (2 for $.99 or $4.99 for unlimited).